Wolves Deal S. Whidbey 1st Loss! Sequim beat previously unbeaten South Whidbey putting a blemish on their 19-0 season on Thursday,May 19th. Jessica Rosencrants pitched a superb game and dominated South Whidbey while the LadyWolves hammered out 8 hits against one of the premier pitchers in the State. Ashley Pearson drove in Molly Fletcher in the 11th inning to secure the win 1-0. Rosencrants and the Lady Wolves are preparing for the District Tournament starting on Friday, May 27th. They will play a final exhibition game on Tuesday against 4A Wilson down in Tacoma. May 13th Sequim beat Vashon in the league finale, 15-0 in three innings. Rosencrants recorded 5 KOs and had two hits. Pearson, Molly Fletcher, and Yamamoto combined to go 9-10 in their combined at bats, driving in 7 runs and scoring 6. Marquita Espinoza had 2 hits and 2 RBIs, Heins was 1-1 with and RBI, Chinn had a triple and Taria Hendrickson was 1-1 scoring 2 runs. Sequim pounded out 17 hits in just three innings, preparing themselves for their final two tune up games with South Whidbey and Wilson. May 9th Sequim beat Klahowya in a lackluster game 4-0. Rosencrants pitched a 2 hitter, striking out 15 and allowing no walks. Ashley Pearson had 2 hits, Yolanda Chinn and Alanna O’Hara had one hit each. 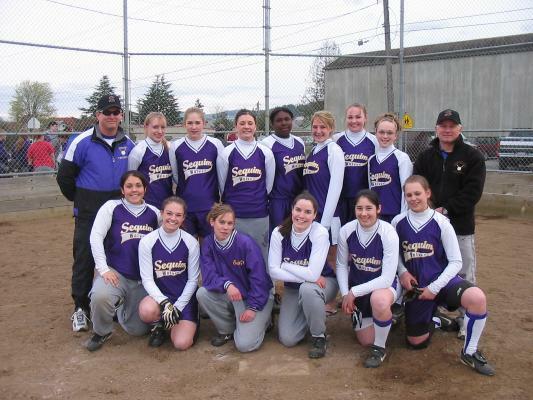 May 6th Sequim beat Life Christian 10-0 in 5 innings at their last home game. Seniors Jessica Rosencrants, Alanna O’Hara, and Hannah Yamamoto were honored by the coaching staff for their commitment to the team. Brianna Ceballos was not present at the game but she too is one of the graduating Seniors. May 5th North Mason took advantage of 3 questionable illegal pitches to score a run in the 5th inning and then scored one in the 7th to tie the game in regulation. In the international tie breaker, North Mason scored in 9th to win the game 3-2. Rosencrants pitched a great game despite the questionable illegal pitches. Katy Heins and Hannah Yamamoto had the RBIs for Sequim. The graduating seniors were honored at the last home game. Jessica Rosencrants will be heading to Southeast Missouri State to pitch and was first team all-conference last year. Alanna O’Hara will be heading to Northwest Nazarene University to play Volleyball on an athletic scholarship, and Hannah Yamamoto will be heading off to the University of Washington to major in Nursing, she was first team all-conference in fastpitch last year. 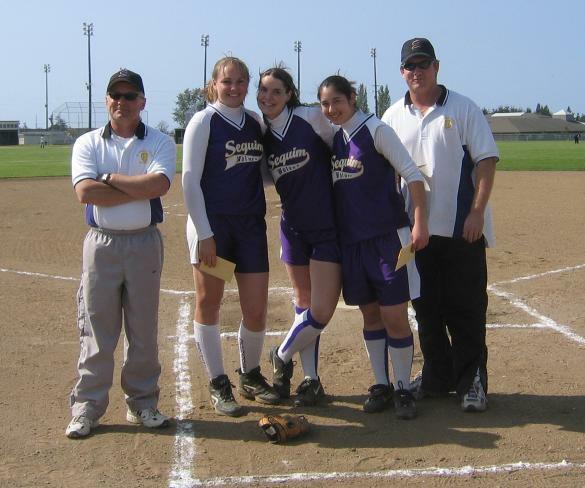 This trio of girls has been instrumental in the success of the athletic programs at Sequim HS. Congratulations ladies and best wishes in your future! 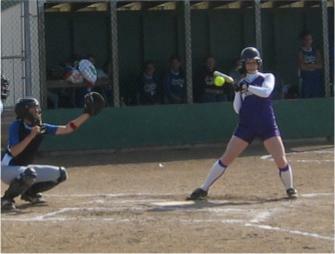 On Wednesday May 4th, Sequim faced the undefeated Chimacum team in a double header. The first game was the official league game and the second was an exhibition game. In the first game Sequim beat Chimacum 1-0 on a single by Katy Heins scoring Ashley Pearson. Pearson singled, stole second and tagged on a long fly ball by Espinoza. Sequim had 4 hits and had scoring opportunities but couldn’t score until the 6th inning. Rosencrants gave up 1 hit, 1 walk, and had 11 KOs. Sequim had only 1 strike out in 6 innings of play as each batter made contact at the plate. In the second game Sequim scored 2 in the first, 3 in the second, 2 in the third and 1 in the fourth innings to beat Chimacum 8-0. Fletcher was 1-4 with a homerun, Pearson 2-2, Yamamoto 1-3, Heins 2-3, Lowe-Thaens 2-3, and Chinn 3-3. Rosencrants gave up 2 hits, no walks and had 10 KOs. Tuesday, Sequim traveled to Steilacoom and pounded out a 14-0 win. Rosencrants pitched a no hitter with 7 KOs. Fletcher went 3-4 with 3 RBIs, Lowe-Thaens went 2-3 and Yolanda Chin was 3-3 with a homerun. On Wednesday, April 27th Seattle Christian lost to the Lady Wolves 4-0. Fletcher and Pearson had 2 hits apiece, Heins, Hendrickson, Lowe-Thaens and Yamamoto all had 1 hit. Rosencrants pitched her normal near perfect game giving up 2 hits and striking out 16. Sequim beat Orting 4-0 running their record to 8-1. Fletcher had 3 hits, Heins had 3 hits, Espinoza, Yamamoto, Kayla Baker, and OHara all had 1 hit. Rosencrants pitched a 1 hitter and had 13 KO’s. On April 20th, Foster suffered a 12-0 defeat at the hands of the Lady Wolves. Sequim had 17 hits. Hendrickson had 2, Espinoza had 2, heins had1 hit, Kokrda had 2 hits, O’Hara had 3 hits, Pearson had 2 hits, as Sequim hammered the Bulldogs. Rosencrants pitched 4 innings giving up 1 hit and recording 10 KOs. Lowe-Thaens pitched the 5th inning and recorded 2 KOs while giving up 1 hit. 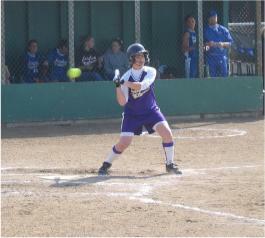 On Friday, Sequim beat Port Townsend 16-0 in 3 innings. Sequim scored 10 in the first inning, 4 runs in the 2nd, and 2 in the 3rd for the victory. Fletcher was 4-4 with a double and a homerun, Hendrickson was 2-3 with a homerun, Yamamoto was 3-3 with a homerun, Espinoza was 2-2, Heins was 2-2, Pearson went 2-3, and Rosencrants went 1-2. Rosencrants and Lowe-Thaens combined for a perfect game. Sequim hammered out 18 hits. On Wednesday, Sequim hammered Cascade Christian 12-0. Espinoza went 3-3 with the Grand Salami. Ashley Pearson went 2-3, Yamamoto went 1-2, Heins went 2-3. Rosencrants pitched 4 innings and gave up 1 hit. Carly Swingle, a freshman, pitched a 1-2-3 5th inning and recorded a strikeout. Eatonville got hammered by the Ladywolves 14-2 in Eatonville. Molly Fletcher went 1-4, Taria Hendrickson was 3-4 with a double, Hannah Yamamoto was 3-5 with 2 doubles, Marquita Espinoza was 3-4 with 2 doubles, Katy Heins went 2-3 with a double, Ashley Lowe-Thaens went 2-4, Alanna O’Hara went 2-4, Kendra Kokrda was 2-4, and Jessica Rosencrants went 1-4. Sequim recorded 20 hits. Rosencrants gave up 3 hits and struck out 14. Wolves Drop north Mason !!!!!!! The Lady Wolves finally beat perennial power and League Champion North Mason 4-3. North Mason had not been scored upon in league in 2004. Down 3-0 in the 6th inning, Sequim loaded the bases but couldn’t score. In the 7th inning Sequim came back and scored 4 runs for the win. Molly Fletcher was 2-4 with 2 RBIs, Taria Hendrickson was 1-3, Alanna O’Hara was 1-3 with a double, and Ashley Pearson was 2-3 with 2 RBIs. Jessica Rosencrants picked up the win, allowing 3 hits, 4 walks, and 4 KOs. Sequim had 3 errors. Erika Quint couldn't have made a bigger impression in her first start. The Central Kitsap sophomore pitched the first perfect game in school history, as the Cougars opened their season with a 1-0 win over the Sequim Wolves. "Very impressive," CK coach Bruce Welling said. "She had good control of her pitches." 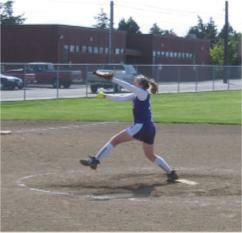 Quint struck out 13 batters and beat a Division I pitcher in Sequim's Jessica Rosencrants. CK scratched out the game's only run in the fourth inning when Britt Walden scored from second base on an error. Although Rosencrants gave up just one hit, CK capitalized on a few errors and scored an unearned run to take the victory 1-0. Sequim was shut down and did not record a hit nor a walk. A ground ball with eyes and a couple of errors were the difference in the game. The LadyWolves beat Forks 8-0 behind the perfect pitching of Jessica Rosencrants. Jessica faced the minimum 21 batter and recorded 12 KOs. Taria Hendrickson went 2-3 with a double, Molly Fletcher went 1-3 with 1 RBI, Hannah Yamamoto went 2-3 with a double and 2 RBIs, Katy Heins went 2-3, Ashley Lowe-Thaens went 1-3 with a double and 3 RBIs, Yolanda Chin went 1-3 with a triple, Jessica Rosencrants went 1-3 with 1 RBI, and Kendra Kokrda went 1-2. The JV girls beat Forks and CK in their games.